SAT DEC 14th! 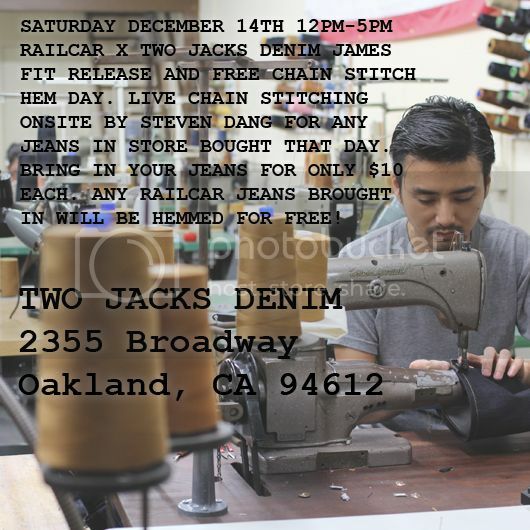 Railcar for Two Jacks Denim event! Hey everybody. Hope you all are well. So we are going to have an event at Two Jacks Denim in Oakland California. 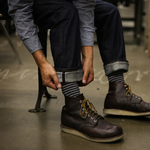 We did a Railcar for Two Jacks Denim special James fit set. The James fit is a fit we came up with that is slightly wider then Spikes fit. .5 inch wider from the upper thigh all the way down to the leg bottom opening. Same leg profile. Just .5 inch wider. With a 1 inch taller rise. Sounds like a slight difference but it does make a big fit change. Anyways, the pair is very nice. Its a pair we made from straight roll to jeans especially for this project with Two Jacks. It has some Two Jacks labeling on it. Ill have to post some pictures. We are making them right now and will finish probably the day before we leave. If you don't know about Two Jacks. Tommy the owner is a super super nice guy. Worth swing by and checking him out and make a new friend. We will also be heming jeans onsite there! Im driving up on Thursday and bringing in my chain stitch hemming machine. I will be hemming any jeans bought that day, regardless of brand, for free. And hemming any jean brought in that day for only 10 bucks each (gas money). AND I will be hemming ANY Railcar jeans brought in that day for free too! I really don't know what else I can do that day to make it special. And worth wild to at least stop by to say hi. Also I will be swing by Costco to get some refreshments. So come on by and have a drink with us. I would seriously love to meet you. Ruben an I are planing to leave in the morning to Oakland San Francisco . Going to stop by the workshop to pick up a machine and get on the 5 freeway.